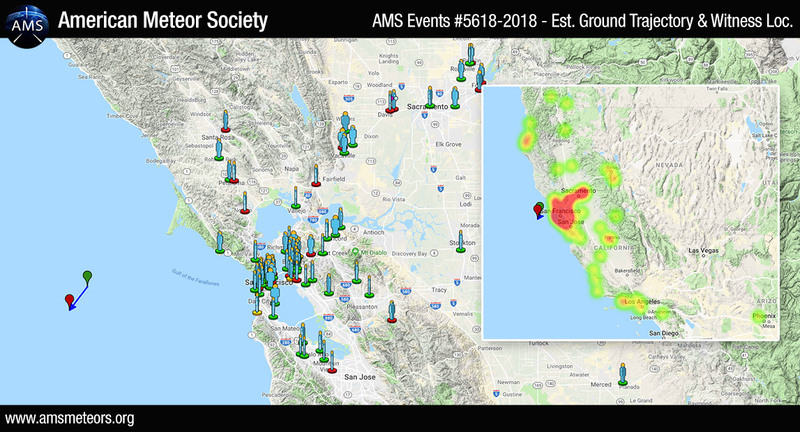 The AMS has received over 120 reports so far about of a bright fireball seen above the San Francisco area on December 19th, 2018 around 5:35pm PST (December 20th 01:35 Universal Time). The event was seen primarily from Northern California but was also seen from Nevada and Oregon. 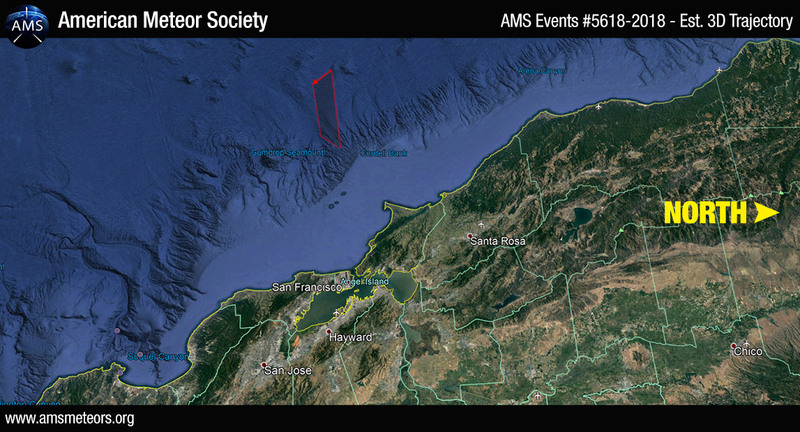 The preliminary 3D trajectory computed based on all the reports submitted to the AMS shows that the fireball was traveling from North-East to South-West and ended its flight somewhere in the Pacific Ocean in front of the San Francisco bay. The secret NROL-71 reconnaissance satellite was scheduled to lift off Wednesday evening atop a United Launch Alliance (ULA) Delta IV Heavy rocket from Vandenberg Air Force Base in California. But Air Force officials claim controllers called the attempt off about 10 minutes before the planned launch, after noticing an issue with the rocket. Did you notice on the first video at 3 – 4 seconds there was another meteor top center of the screen going right to left. I think that this a reflection of a streetlight or headlights off the dashboard and again off the windshield. Amazing event, as witnessed from Half Moon Bay it looked to be a few miles west above Mavericks surf spot. In the footage from Nevada, a light appears rising from mid air up to the sky. Also, the trajectory changes slightly in other videos midflight. Compare the light and trail, plus the smaller explosion going up (unmanned minuteman missile which also occur from various air force bases). How do you explain the smaller explosion going up? We saw the meteorite as we were walking by Ocean Beach in SF, and the reason why it appeared to be so bright is because the plume of compressed air was lit by the last rays of sun against the dark sky. It was truly amazing! Past 420ish pm (rush hour). Sighting of several fire balls in the same time occur South Colorado Springs behind Fort Carson (Army base). I thought it was a military exercise. It couldn’t be because the sky was too dark starting to snow.